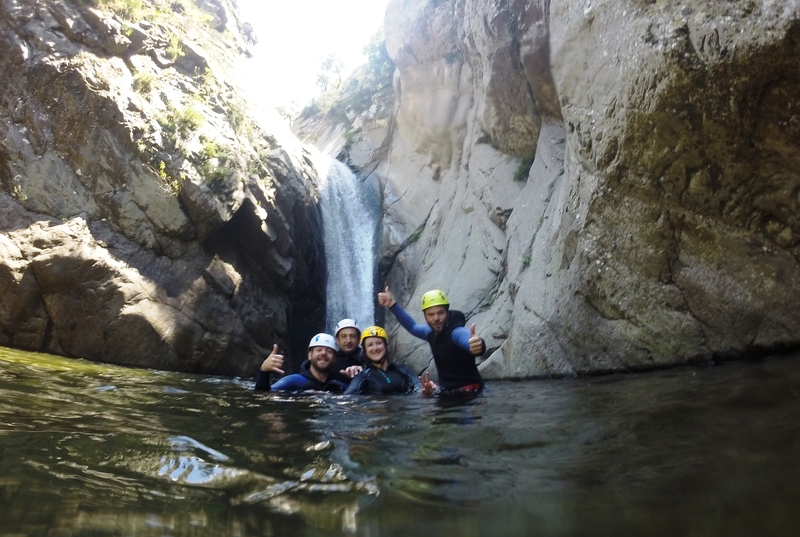 Enjoy with the family and friends of the Canyoning in the Pyrenees, an adventure activity that you will never forget. The canyoning or descent of canyons is a sport activity that consists of progressing through the bed of a ravine, whether it is jumping, swimming, walking, diving or rappelling, being able to make a very varied route. Depending on the time of year, we find ravines with their pools, water slides, natural waterfalls, jumps or we can go into dry ravines with more rappels and spectacular rock formations that have been forged between sinuous gorges. With SB Canyoning you can enjoy this adventure activity with the maximum safety, with the supervision of the descent by qualified professional guides. We make ravines a la carte; throughout the Catalan Pyrenees, Pre-Pyrenees, French Cerdanya and we also organize scheduled trips to the Sierra de Guara (Huesca). We make ravines of all levels, depending on the physical condition and experience in canyoning of our clients. The minimum age for this activity is 9 years for the practice of canyoning, and 7 for water trekkings. What material do I need to practice canyoning? What services are included in the price of the activity? What is the reservation and cancellation policy? To make the reservation effective, it is necessary to pay 30% of the total price of the reservation, as a down payment. We will proceed to the return of the payment and signal, in full, in case of extreme weather that does not allow the development of the planned activities, or making the cancellation in a period of 10 days before the scheduled date to carry out the activity. 50% of the payment will be paid by canceling the activity in a period of 7 days before its realization. Pay and signal will not be paid if the cancellation of the activity was made during the same week in which the contracted activity was to be carried out.